On Tuesday night, April 26, 2005, Tori appeared on the Tavis Smiley show, a talk show on PBS TV in the U.S. Tori did not perform but was interviewed for about 12 minutes by Tavis. Click for details, a transcript and some screen shots. Phillip Flores informed me that you can find a transcript of Tori's interview at pbs.org. I have also included it below. 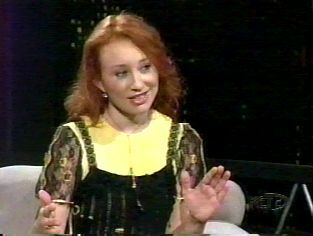 Tavis: I'm pleased to welcome the awfully gifted Tori Amos to this program. The popular singer-songwriter has just released her ninth CD, which is receiving terrific reviews. The disc is called "The Beekeeper." It is her fifth CD to debut in the billboard top 10, which puts her in the rarefied company of artists like Barbra Streisand, Janet Jackson, and Madonna. 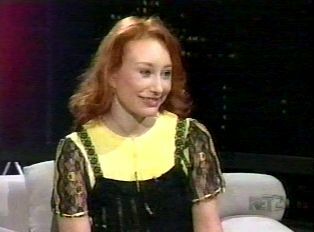 She's also the author of a new book called "Tori Amos: Piece by Piece." But first, from the CD "The Beekeeper" here is some of the video for "Sleeps with Butterflies." Tavis: Tori, everything you touch just turns to gold. Nice to see you. Amos: Good to see you. Tavis: Gold--I'm disrespecting you. Not gold, platinum, double platinum, triple platinum. What's the secret? Everything you put out goes to the top 10. Amos: Well, I try and listen to the songs as if they're beings. I see them as creatures. My grandfather taught me--well, he tried to teach me anyway--about the sacredness of life. His people were on the Eastern Cherokee tribal rolls, and they escaped the Trail of Tears, and lived in the Smoky Mountains. And they taught him the stories and the way that they would listen to the earth mother, and he was a great storyteller. So I would sit on his lap as a little girl and listen to him weave tales of things that were happening at the church and town. Tavis: How does that translate, years later, into how you go about constructing your lyrics, because I get the sense that lyrical content is important to you. Amos: Everything's important to me. What is not music within the song is important. When you breathe, the silence is essential. Every ingredient. That's like saying to a chef, "Well, the salt, where is that?" Doesn't even matter. It's so simple, like breathing. Every element is part of this structure that you're creating. Music is ether, so I'm trying to translate this ether entity into a sonic...hmm...building, if you will, that you can walk into without leaving your chair. Tavis: Tori Amos is too deep for me. Ha ha ha! But that was so very, very nicely put, and it leads me to ask this. How did you know that your mission was to be in construction? If you feel me. Amos: Yeah, I feel you. Well, I've had to be tugged and pulled and I've had some great pushes and teachers along the way that wouldn't put up with me slacking off. And I think that I really needed--all children that have potential are only that. And unless there are those of us--I have a little girl now who's 4 1/2, and I'm watching how, wow, without my parents--my dad is a theologian, he has his doctorate from Boston University and very Christianized, and my mother has her Cherokee belief system and yet is a very Christian, gracious woman, and so I don't necessarily see their ideology as my own. However, the discipline and the, you know, the nurturing of this garden to allow you at a certain point to be your own gardener, now that was the trick. That's where my papa, my grandfather, said, "You have to tend your own." and I'm seeing with my daughter that now everything that we do is part of giving her the tools to either be a creative force or just kind of be...not one. Tavis: Yeah. You've raised your daughter's name now--or raised your daughter a couple of times in this conversation, and every artist, every person, not just artists, every person who's busy and who travels and moves around and, in your case, puts out CDs and writes books, has to figure out how and when and the space in which they're going to engage their children when they have kids. From what I'm told, you, like, don't do anything without your daughter. You don't go places without her, you don't move without her. Your daughter is like a part of every single thing you do. One, is that true, and number 2, how do you do, back to my point, all of this and never leave your daughter out of any of it? Amos: Well, I was an older mom, and I suffered a few miscarriages. Tavis: Which you write about in this book, and I want to come back to that, but go ahead. Amos: And I think that I began to really look at what I wanted my relationship to be. And I looked at my mother and how she and I have always been extremely close. She's my touchstone. And she taught me the love of stories, and I think without my mother, I would be a musician, but I wouldn't necessarily be a songwriter, because my mother was reading me Edgar Allan Poe when I was 5, and she was going to be a teacher of literature. And so she never fulfilled that dream, but you see, she passed her wisdom and her learning. She's my greatest teacher. And so seeing that relationship, and you know, when you're climbing, especially in the music business, it can be very, well, extremely ferocious to hold the artist and yet the music business and music sometimes, it's a dichotomy. There's not a lot in common with music and the music business much of the time. Amos: So I wasn't necessarily thinking about, you know, how to be a mom like my mom was to me. But I think surviving these very painful losses gave me so much, and it gave me a sense of life, really a value and how truly fragile and precious life is. So when the gift of motherhood came, it wasn't just, oh, it's something--it's an entitlement, it's something that women get to do because we're chicks. I really began to see I have a chance here to be any kind of mother I want to be. What kind do I want? And if I can emulate my mom, what a gift. Tavis: Hmm. Let me ask you, to your earlier point about the miscarriages you suffered, why it is in this book "Piece by Piece," you--and "Piece by Piece" is an appropriate title for it-- because you didn't leave any pieces out, it seems. You were so open, so expressive, so forthcoming, I know other people are going to be enlightened and empowered and encouraged by that, fans and beyond fans who pick up this book and read it, but as I went through this, though, I was wondering why you felt the need to be, the call to be so comfortable with being so open, because your fans aren't necessarily entitled to all of that, but you put all of it out there. I can't imagine something more painful than a miscarriage, and you talk about it in this book. Amos: Ann Powers, the woman that I collaborated with on this book, she is quite a force in the music industry. She can be a pretty tough critic from the New York Times. She's not there anymore. She's gone on to do other things now, and we started as acquaintances and ended up as dear friends. And she would say to me, "Look, I know that some things are hard to talk about, but you do talk about them in the songs, and this is an opportunity. We're just having a conversation." and maybe I felt a little more, I don't know, this illusion I've painted for myself that I was writing at 4:00 in the morning in the middle of nowhere in Cornwall, England, before the cows were up next door, and you don't really think about the hundreds and hundreds of people that might be listening in on this conversation. You agree to let people in on this conversation between 2 women that have survived the music industry. She, again, this paradox from the opposite side, the critic, the journalist, and me the musician side. And yet we've both survived, um, pretty harrowing experiences as women. And we're both mothers, and she said, "This is really important because sometimes we're dehumanized. We become objects as the artist and the image." and we talk about that. But people need to know that...an artist isn't-- it's not a job. It's--it's the artist's path. It's your life. But you're still a woman and a mother, and you go through what many other women do, but-- but sometimes suffer in silence and don't talk about it. Tavis: I am so fascinated by this conversation, as I say from time to time on this program. But I could do it ad nauseam. Let me close our conversation, Tori, if I might, where I began the conversation. You are having so much success--the CDs, the music, the touring, the books, motherhood--so much success, and you seem to be having fun at it as well and enjoying it. Tell me how you process--this may sound strange--tell me how you process the success that you have. Why have you been so fortunate? How do you process that so much good, so many opportunities to do good...have appeared for you and you've been so fortunate? How do you process all of that? 'Cause you seem to have a good handle on this. Amos: I think that my grandfather said to me something that is the greatest. It stuck with me. He said, "You either at a certain point become a caretaker for the great mother, and as you walk around the wheel of life, around the medicine wheel, you start in the South and you move yourself around the wheel to different experiences. And at midlife, you can choose to be a woman bridging from the young to the old, and you can honor all of womanhood, not wanting to be a youth anymorebecause then that's jealousy. That's evil. That's anger. That's poison in your heart. And you can honor the great wisdom of the great grandmothers." and he said, "If you can hold the space of you're either a caretaker in a loving, um, nurturing way, or you're a taker." Tavis: So you're either a caretaker or a taker. Tavis: I love this woman. 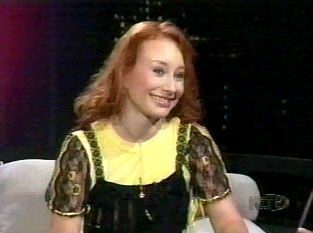 "Tori Amos: Piece by Piece" is the new book, written along with Ann Powers. 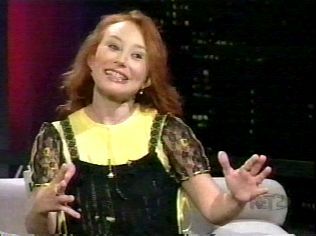 And the new CD, of course, as you know, "The Beekeeper," by Tori Amos. I am honored to have you on the program. Nice to meet you. Tavis: Pleasure's all mine. Wow. That's our show for tonight. A reminder: Starting this weekend, you can catch me back on public radio--PRI-- Public Radio International. Check your local listings. I'll talk to you on the radio very soon. But I'll see you back here next time on PBS. Until then, good night from Los Angeles. Thanks for watching. And as always, keep the faith. Tori was interviewed for about 12 minutes. She talked a lot about what she learned from her Grandfather and how she views songs as creatures or beings. Tori also talked about being a mother in the music business, how she learned a lot from her own mom in that respect. She the addressed the issue of staying close to Tash while still being active with her music. She answered a question about being so candid about personal things like her miscarriages in the book Piece By Piece, and talked about how she continues to be successful at what she does. It was an interesting conversation. If anyone has a transcript, please send it to The Dent.